In an environment of academic excellence, TAU harnesses, develops and catalyzes the conversion of the full potentials and capabilities of students into becoming responsible and competent professionals in agriculture and allied disciplines. 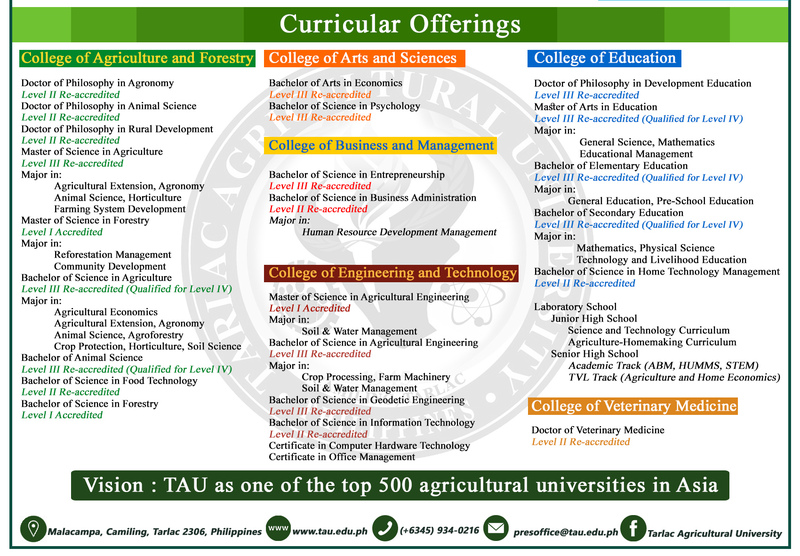 TAU shall primarily provide advanced education, higher technological, professional instruction and training in the fields of agriculture, agribusiness management, science and technology, engineering, teacher education, non-traditional courses, and other relevant fields of study. It shall also undertake research, extension services, and production activities in support of the development of the Province of Tarlac, and provide leadership in its areas of specialization.